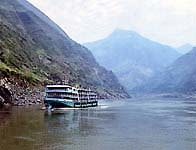 Xiling Gorge, one of the Three Gorges on the Yangtze River, is 76 km long from Xiangxi River in Zigui County in the west to Nanjinguan in Yichang in the east. The gorge is famous for its many shoals and rapids. There are many big or small gorges within the entire extending distance. They are ( from the west) the War Art Book and Sword Gorge, Ox Liver and Horse Lung Gorge, Light Shadow Gorge and Ox Gorge. There are not only cliffside waterfall, but also wonderful limestone cave near the Light Shadow Gorge.